We opened our doors for business at the beginning of 2014 and have made it our mission to provide small businesses with the sort of borrowing experience that's usually reserved for banks' big corporate clients. Flexibility is literally in our name; it's a high priority - whether it's making sure the client gets exactly what he/she needs, or different people in our business all pitching in to get things done. Additionally, our business is driven by transparency and personal relationships. We think they're essential elements for any lender. Our clients get the best of both worlds - the finance they need, fast, without bouncing around call centres or receiving computer-says-no answers. We do this by leveraging our technology to provide finance at 21st century speeds while still providing each applicant with a dedicated relationship manager, who ensures that the needs of each client are met throughout the entire lending process. Your business is too important to be put in the hands of machines. At Fleximize we get that. To be honest we're pretty "Flexible" and we have created a service that can work for all types of small businesses. However, we do have particularly good solutions for retailers and seasonal businesses like pubs and restaurants; we've also built our systems to make sure we're able to cater for e-commerce businesses. Typically it takes anywhere from 1 - 3 days to process an application from start to finish. The process can be completed within 24 hours, however this is all dependent on how quickly we receive any required documentation. We work with all our applicants to understand when the finance is required and will do our best to ensure we deliver a decision within this timeframe. Regardless of where you are looking for finance, plan as far in advance as possible! Being prepared to look for funding makes a difference. A lender could look at two companies with identical financials and come up with very different decisions based on how far in advance funding is sought and how well prepared the documents are. "The best experience in funding the business. I was really impressed by the perfect communication that I've had with my dedicated account manager. I've been constantly informed about every stage of my application. A breath of fresh air in a usually hostile climate of funding small businesses. Thank you!" "Acquiring business finance for us has been a real pain! Automated credit scores, minimum requirements, you name it. 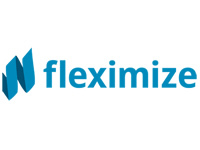 Fleximize offers a personal touch and gets to know you and your business. It analyses every detail to ensure you can fulfill the agreement. I'm really glad I got approved and would recommend them 100%." Q: Are there any sporting rivalries in the office? A: One of our founders, Pete, is a huge Arsenal fan, which doesn't sit well with Relationship Manager Stacy who is a died-in-the-wool Tottenham supporter. Monday mornings can be brutal; though we'd never let it get in the way of our business!